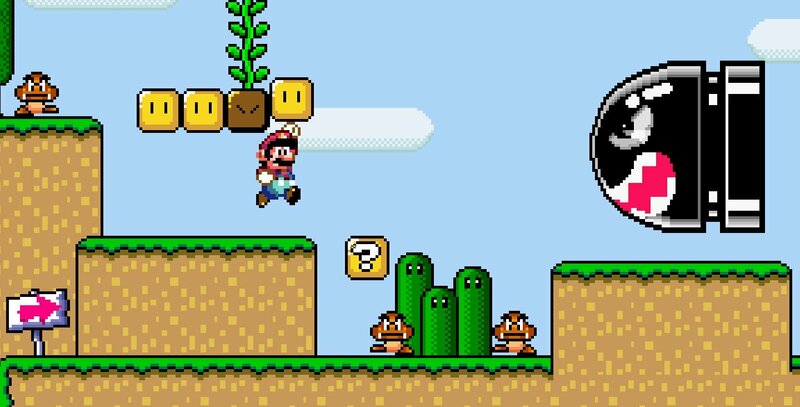 In our 1990 entry we covered Super Mario Bros. 3, so rapidly moving onto Super Mario World is an indication of how localisation delays and the eventual step into 16-bit caused a bit of Mario congestion in the early '90s. We're determining our years predominantly on North American release dates, after all, and it's worth noting that Nintendo was already relatively tardy in joining the 16-bit era with the Super NES - not that it did much harm to its prospects, ultimately. While Super Mario Bros. 3 pushed the NES to its limits and incorporated a special chip in the cartridge, Super Mario World provided a generational leap that had been long awaited at the time. Perhaps generational leaps are losing some of their wow factor in the modern day, but the progression from NES to SNES was significant from a technological standpoint, and Nintendo pushed its new system to transform the look and feel of its leading franchise. Particularly striking was the new graphics engine, with chunkier, more colourful sprites that were quite a step up from its immediate predecessor; a fun fact is that Super Mario World was subtitled as Super Mario Bros. 4 in Japan, so it was a direct sequel of sorts. The generational switch changed up all aspects of the presentation in distinct ways, with even the soundtrack utilising the new hardware's capabilities. With that buzz as a SNES launch title came further innovations. The extra buttons on the controller - eight buttons instead of the four on NES (including Start and Select) - brought transformations to the gameplay, with a spin move joining jumping and dashing. Beyond that, of course, an iconic new character was born. Super Mario World brought us Yoshi or, to be precise - T. Yoshisaur Munchakoopas. According to our poll when that little snippet was revealed the T in the name is "the greatest mystery of our times" - we're sad the Nintendo Life community didn't vote in big numbers for Thierry, though Tupac was a popular choice. That bit of lore stated that Yoshi is a dinosaur, which was one in the eye to, erm, Nintendo, which once told us off for calling the cute little green companion a dinosaur - "Yoshi is a Yoshi", we were told. In any case, a companion for Mario to ride around and then cruelly ditch into a pit when necessary had been on Shigeru Miyamoto's wishlist since the NES days. The power of the SNES made it possible, and Yoshi shook up gameplay with his varied abilities and went on to become a treasured member of the Mario family - the sequel to this title was all about the side-kick, after all. Super Mario World, no doubt helped a great deal by being a launch title and therefore being an ever-present for a whole generation, would out-sell Super Mario Bros. 3, though arguably didn't have quite the same impact in popular culture. Nevertheless, it's regarded by plenty as the finest Mario game of all, and its litany of secret exits, collectibles and extra levels make it a dream for completionists and 100% speedrun experts. It's a hugely accomplished game, and should also be credited for its own boundless creativity. Dinosaur Land serves up some memorable settings, while clever and puzzling levels are accompanied by some terrific items such as the cape. 1990 and 1991 brought two of the very best titles in Mario gaming, and Super Mario World benefited from a development team on top form and technology that allowed it to produce some terrific ideas. In any battle for the crown of 'best Mario game', this one is always in the running for the top prize, and it'll likely be a hugely popular template in Super Mario Maker, too. This is the game that made me fall in love with Nintendo. It is simply a masterpiece and it stands the test of time even to this day. The controls felt natural and the difficulty was absolutely spot on. I can't wait to finally create my own little versions of Dinosaur Land in Super Mario Maker. Now this game might probably be my most favorite Mario game ever, along with SMB3. (I honestly can't decide which is my favorite). Great levels, great enemies, creative bosses, great power ups, Yoshi, the abilities that come with the different colored Yoshis, secret exits, good challenge, great music, great graphics, and great controls. Nearly everything about this game is just awesome. SMW is just a brilliant game in general. An all time great - the first Mario game I ever owned (even though I used to play Donkey Kong in the arcades when it came out). I got it after I owned Sonic on the MD, and the depth in this was just ridiculous in comparison. On face value it looks so simplistic, but the play mechanics are on a whole different level. There is no contest really; this is the ultimate Mario platformer. Best looks, best soundtrack, precise controls and some very challenging level designs. I would happily trade all the others for this one game. 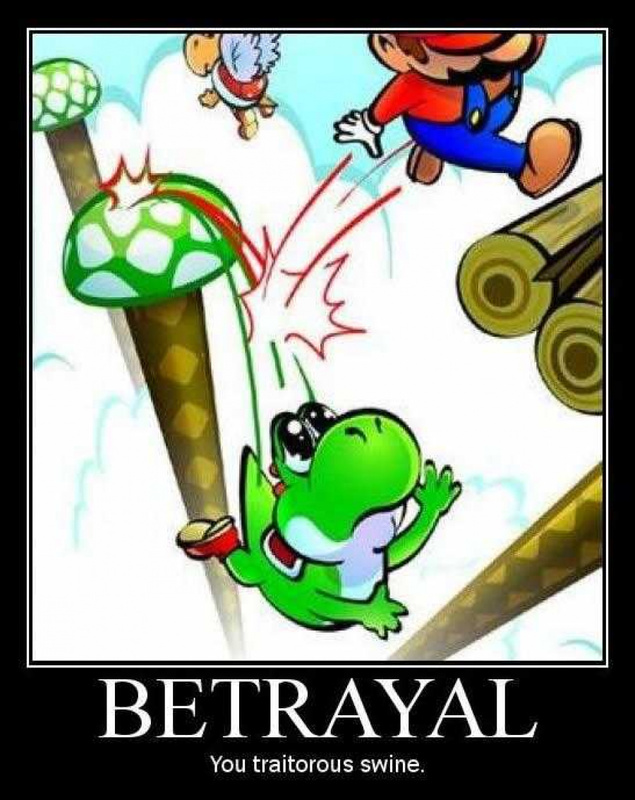 The New games didn't seem to use Yoshi very much, which is a shame. And I rather like the Super Mario World Yoshi abilities based on Yoshi color and / or shell color. Blue Yoshi is best Yoshi. Also, the Cape. Awesome for cheesing levels. Who needs a P-Wing? It just never gets old. I've been playing this game for well over 10 years, and I still love it. Amazing game. Nintendo of America people can't even keep it straight. In 1991, Nintendo Power called him a dinosaur, the game itself calls him a dinosaur, yet these reps are like "Dinosaur? He's not a dinosaur, he's a Yoshi!" Then, why is he called a dinosaur by you in the past?? The cape is still one of my favorite transformations for Mario right up there with the Tanooki suit. Mark my words...before Super Mario Maker is released, I WILL finally beat Super Mario World!...For some reason, I never managed to beat it. Which is terrible, because it's an amazing game! Something that i will always remember in Super Mario World is the forest level, because it starts at the "end" of the level, all levels were from left to right but that level was from right to left, i loved it. IMO by far the best side scrolling Mario. Playing this as a kid the game felt huge with all the bonus content. It's sad to think that most of the extra stuff in the games back then would be DLC today. If Nintendo remade this game with the New Super Mario Bros. graphics AHHH!!!! That would be too awesome. @DarthNocturnal agreed Blue Yoshi is best! Ahhh, Super Mario World, the only main Mario game THAT DOES NOT HAVE GOOMBAS! This, A Link to the Past and Street Fighter II are my top 3 of all-time. I don't know if I'd say Super Mario World ranks ahead of A Link to the Past but I have put more hours into SMW than any other game I've ever played. Loved it in 1991 and it hasn't lost its charm all these years later. I'd love to see Nintendo do something with this game similar to the Genesis 3D Classics but I don't think I'd want them to change the style. It may not look as clean but I still prefer this style to NSMB. This is a very fun game, one of the true greats on the SNES but with the exception of a few levels and the hideously hard Special World levels, the main part of the game is a breeze. SMB2 doesn't have them either. I do. I prefer the Leaf and the P-Wing to everything else Mario's ever used to fly with. But SMB2 isn't a Mario game, it is a re-skin of Doki Doki Panic. The first videogame I ever played! My parents bought me the SNES when I was 4 years old and SMW came with it! Honestly, I have mixed opinions on this entry. The graphics aren't that great. Most of the level ground feels just flat colors. Over half of the level design isn't that great when you take a closer look at them, which in turn, they are easier. I suppose that's why people who played SMW first complain SMB3 is slippery. I suppose that's what you get when you rush the game to make it a launch title. Still, it has its good stuff. The overworld is amazing, as well as yoshi is there. But I prefer SMW for hacking only. One can fix the game with it, now to mention SMW is the base for those awesome rom hacks. I'm in the SMB3 camp when it comes to best Mario game, Mario Galaxy second and SMW third, it's a wonderful game some great memories playing it. When SMMaker was first announced I was mildly interested. When they announced it would feature SMW my interest shot up ten fold. Until recently I was undecided on the best Mario game, this or SM64. I've now come to the conclusion that SMW is the greatest Mario game, it's pure platforming perfection. It may not have been as ground-breaking as SMB3 but it betters it in every other imaginable way. This article really makes me want Super Mario World on 3DS. Still the best 2D Mario game to me. I hate the fact that the New SMB Series didn't came up with more of the SMW Look and Feel. I love Super Mario World, I remember being in the USA and seeing it in someone's house, I was fascinated by it, by the world map alone. The game is incredible and I recently completed it again on my GamePad. Well, I'm missing an exit actually and it's driving me mad! The greatest 2D platformer ever created imo. The even more refined and basically perfected controls, in terms of sheer precision and responsiveness (tightened inertia and less sliding when you change direction), is one of the main things that elevates it above all the Mario platformers that came before it imo. Edit: Hey; that top image isn't actually from Super Mario World, or at least not the final version, because there were no normal Goombas in SMW. Where is that image from? @PigmaskFan Woah, really? My mind is blown! @Cyber-BLP-- What issue do you have with slopes and sliding? This is my preferred Mario game to play on emulators - the graphics are the best and the controls are nice, not to mention AIRSHIPS and the cool storyline, awesome bosses and YOSHI! My first game ever and favorite Mario game. I love every time I see a reference to it. On a side note that screenshot up top isn't from the game. It looks like a hack or something someone made mixing in some SMB3 elements. This game has always been my favorite 2D Mario game and quite possibly my favorite in the series altogether. The Super Mario World template is likely going to be my preferred design in Super Mario Maker as well. Great game and great memories though I feel the GBA version is a bit better thanks to Luigi's jump being floatier like it is in SMB 2. This was the very first game I played. It was Mario World and A Link to the Past that made me Nintendo fans. That being said, I can't help but notice the first screenshot isn't from Super Mario World. Goombas weren't in the game, just Galoombas. Prefer smw2: Yoshis island myself, best 2d marionette game for me but this is a close second. Remember being blown away by those shiny graphics at the time. Just completed nsmb u yesterday and while I really enjoyed it, I feel that spark of magic wasn't quite there, the 2d marios feel too formulaic now. Or maybe Nintendo have just been spoiling me for 25 odd years so I now expect magic from their games as standard..
Smw was a pack-in with my pal snes- the 1st system I paid for with my own earnings, and still own. I can remember running around trying to find a mains plug to fit the ac adapter cos it came with bare wires!! What a game though.. Easily my best mario memories, my bro and I played this to death. Finishing the special world is one of my top gaming moments! Platforming perfection. @Pentarou ha ha!! I remember that pain in the @$$ of having to fit a plug on yourself, the good old days indeed! I'm sorry but your opinions are wrong. SMB3 is the best 2D Mario game. I will never forget the Christmas when I first received my Gameboy Advance. The game I got along with it was Super Mario World. I spent countless hours playing this game during my Christmas break as a little kid, everything about the game amazed me. To this day it's still my favourite Mario game and one of my favorite games of all time. I didn't play this until I got the GBA version. It is my favourite of all the 2D Mario games. Absolute side-scrolling platforming perfection. This game wasn't part of my "childhood" like a lot of other people on this site, but upon playing it, it still releases this aura of nostalgia... The music, the graphics, the design, it's all very memorable regardless. Would never sell my JAP copy, I love it too much. I never did find the last exit (96th)! A rush of nostalgia every time I pop the cart in. I've come back to this title more than anything else in the Mario series. It's a top 10 SNES title, for me, and I wouldn't say the Mario games are necessarily my favorite games to play, although 3D World was really well done. Edit: Although having a quick go on both SMW and SMB3—the slope/sliding stuff in SMB3 does feel a little more satisfying; mainly because you don't automatically slide down slopes just by standing on them, which gives you a bit more control and also just makes more sense to me. Luckily, you very rarely have to slide during especially important moments. I'm not experiencing any inconsistency in SMW, in terms of how it works though. It seems to work properly, except you just automatically slide on slopes instead of standing. Either way, I'd still say that I like the controls in SMW better overall. The more responsive movement, less inertia, and easier control over Mario in mid-air, still makes it the best controlling of the classic Mario platformers imo. Absolute masterpiece and the best 2D Mario in my opinion. Masterpiece indeed and one of my favorite Mario games compared to the others. This is the best platformer ever made, in my opinion. At the very least, it's the best Mario game. Both the graphics, the soundtrack, the controls and the PHYSICS are just perfect. New Super Mario Bros. is a joke compared to this. SMW is my favourite Mario game. It has it all. I still remember getting my SNES for Christmas in 1991 and being utterly blown away by the graphics in the first world. As someone who was a veteran of the three previous Mario games, I just couldn't believe how amazing the 3D backgrounds looked, and I was utterly delighted by the depth of color, shadows, and complexity of the the sprite-work. That's not even touching the music and quality of sound, which was beyond anything I'd EVER previously experienced on a console! Throw in excellent bosses and imaginative takes on the Koopalings, and some very nice bonus levels, and you have what is truly a masterpiece for the ages! That this was a pack-in game was only things that much more impressive. Unbelievable quality - graphics, sound and control! Probably the best main-Mario side-scroller - and, even with 3D Marios included, I'd easily argue that Super Mario World is a top 5 game in the series, period. I'm not as much of a Nintendo guy as many others around here. I remember getting an NES late in its life. I never owned Mario 3, but played it a ton thanks to various friends who had it. It really was, and still is, an amazing game. They nailed it with that one. I finally got to go back to it a few years back and about the only complaint I had was some levels seemed extremely short. That was one of the improvements I really liked for Super Mario World, having longer levels with the half-way checkpoints. The levels felt just right in length in that game. I think SMW is a bit better as it's a nice refinement to the great foundation that was SMB3. I do prefer the power ups in part three, however. Both are great games that I will always come back to. I was freaking out as a kid when I first played this on the SNES at my neighbors house. Such a good game! Even if I wasn't a Mario fan, this game would probably stick with me for the rest of my life since it was the first video game I've ever played. It's because of this game Mario is who I think of first whenever I think of video games, even over my other favorite franchises. @Kirk Yes, of course there were airships in this game. I never make mistakes. @Kirk I blame the game which mashed together SMB3 SNES graphics with SMW graphics for that. @Calllack Well, I guess you could call the sunken ghost ship an "airship". @Calllack #60 Super Mario All-Stars. Yeah, I can see how that could confuse you.